The future of the Georgia ports is never far from the mind of Executive Director Griff Lynch. Lynch let the public in on his vision, and that of the Georgia Ports Authority board, at the annual State of the Port event Sept. 20. 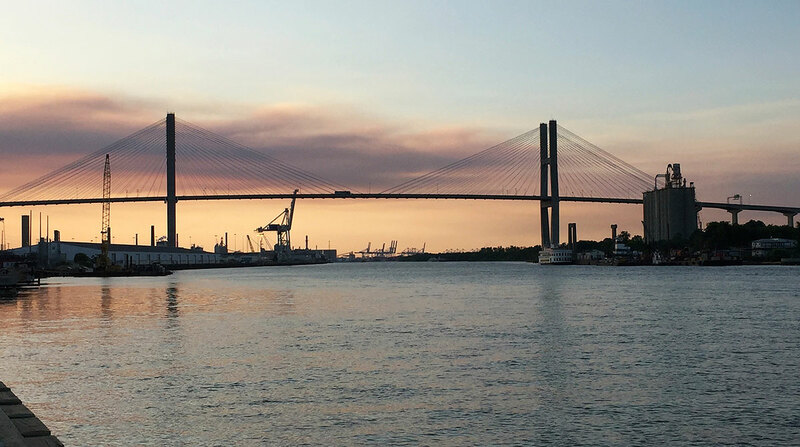 A portion of GPA’s plans include a goal of doubling the container capacity of the Garden City Terminal and the possible replacement of the Talmadge Memorial Bridge that spans the Savannah River. Lynch pointed to the ongoing record-breaking growth with 4.2 million TEUs handled this year, an increase of 8.4%. That growth, along with a 16% increase in intermodal rail lifts, has contributed to Savannah’s cargo growth outpacing the nation. A TEU is an industry-standard 20-foot container equivalent unit. Lynch expects that growth to continue. The Savannah Harbor Expansion is halfway finished and expected to be completed by late 2021. The deepening will allow ships of 14,000 TEUs, called neopanamax ships, to come to Savannah at capacity. Currently, a number of those large ships call here but are not able to be loaded to capacity due to the river’s depth. Ships are getting even bigger, with 19,000-TEU — and even 22,000-TEU vessels — making calls at some ports. The Talmadge Bridge, with a vertical clearance of 185 feet at high tide, is not tall enough for the 19,000-TEU vessels that are highly stacked with containers. Talks about a new bridge are in the planning stages, and no details on size needed or cost were available. GPA will spend about $2.5 billion over the next 10 years on projects related to increasing capacity to handle 8 million TEUs by 2028. Projects include an expansion of the ship-to-shore crane fleet from 32 to 42 cranes. This includes replacing the older cranes so that all cranes can handle 14,000-TEU vessels. There also will be gate additions, container-storage expansions, berth improvements and off-terminal road improvements. The first six employees have been hired for the program, called YES (Youth learning Equipment and Safety). The students were referred by school administrators after taking classes and expressing an interest in a logistics career. Lynch and GPA Board Chairman Jimmy Allgood praised Gov. Nathan Deal, who spoke at the event, and state economic development officials for their work in past years and in 2018. “Almost eight years ago, Gov. Nathan Deal established a goal to make Georgia the best state in the nation to do business by providing state government, business leaders and our ports what they needed to make that happen,” Allgood said. Allgood noted that since Deal took office in 2011, the Port of Savannah has grown by 45% or an additional 1.2 million TEUs; the harbor deepening project has been approved and is 50% complete; and, state transportation improvements such as the Jimmy Deloach Parkway ensure that cargo moves more efficiently and without delay. With state help, for fiscal 2018, 29 port-related projects were realized, bringing more than $1 billion in investment and 4,741 jobs to the state, Lynch said. Deal announced that Georgia had been named the No. 1 state for doing business for the fifth straight year by Area Development magazine. The magazine is geared toward site selectors and facility planners. Area Development stated that competitive labor environments and leading workforce development programs, low taxes and utility costs, favorable regulatory environments and cooperative state governments are among the top-ranked states’ pro-business attributes. The annual event is sponsored by The Propeller Club Port of Savannah, a local professional organization for Savannah’s maritime community.